EL PASO, Texas (AP) - U.S. authorities never searched the yacht they say carried an ex-CIA agent illegally from Mexico to Miami in 2005, and they have no photographs or other physical evidence that he was ever aboard, a federal investigator acknowledged Monday. 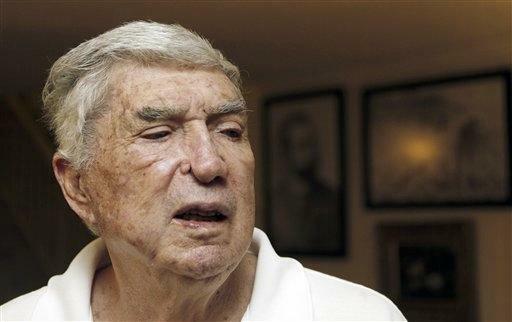 Steven Ussher, an Immigration and Customs Enforcement special criminal investor, told a West Texas jury he was in charge of the case against anti-communist militant Luis Posada Carriles beginning in April 2006. He said investigators never thought to obtain a search warrant so the vessel in question, a converted shrimper called "The Santrina," could undergo forensic analysis. Posada, 82, is accused of lying under oath to federal officials during immigration hearings in El Paso and faces 11 counts of perjury, obstruction and immigration fraud. He said under oath that he paid a people smuggler to drive him from Central America over the Texas border and then to Houston. Prosecutors say he actually sailed aboard the Santrina from the Mexican resort of Isla Mujeres to Miami, where he slipped ashore at a waterfront restaurant in March 2005. While little known in most of the U.S., Posada is considered a hero among some Cuban-American exiles and is public enemy No. 1 in his native Cuba, where he is viewed as former President Fidel Castro's personal nemesis. Other charges against him stem from his failing to acknowledge planning a series of bombs that exploded in hotels and a top tourist restaurant in Havana in 1997, killing an Italian tourist. Posada admitted responsibility in a 1998 interview with the New York Times, saying the attacks were meant to hurt Cuban tourism - but has since recanted that. The trial began Jan. 10 and featured testimony from the Santrina's mechanic, Gilberto Abascal, a government informant. Abascal testified that Posada sailed to Florida aboard the yacht and showed a photograph of Posada getting a haircut at a barbershop in Isla Mujeres. But when pressed by Posada defense attorney Arturo Hernandez, Ussher said authorities have relied only on Abascal and don't have evidence placing the defendant aboard the boat, or any pictures of him actually on it. "Why didn't you get a court order or a search warrant to search the Santrina?" Hernandez asked Monday. "I never requested one," Ussher responded. He later testified that searching the yacht was not a priority since a year had passed since its alleged arrival in Miami by the time he took over the case. Another key element in the case has been a Guatemalan passport under the name of Manuel Enrique Castillo Lopez, but featuring a photo of Posada. Prosecutors say Posada used it to travel to Mexico and make contact with the Santrina. Hernandez asked Ussher about fingerprints contained in an application for the passport, which the Guatemalan government sent to U.S. investigators. The attorney wanted to know if investigators ever checked the prints in that application against Posada's real fingerprints. "We wanted to have the fingerprints checked but we were waiting for them to send us a better copy," Ussher said. He said more legible copies of the prints in the application did eventually arrive, but that he did not know if they were ever compared to Posada's real ones. Also Monday, James Patterson, an Immigration Services officer based in El Paso testified about the process of seeking U.S. naturalization. He took the stand as part of an attempt by the prosecution to dispel defense claims that American authorities knew Posada was ineligible for citizenship due to his violent past, but conducted 10 hours of interviews over two days with him in order to build their criminal case. Patterson said that someone convicted of a prior felony would be rejected for citizenship but would first have to undergo a hearing to determine that - though he acknowledged Posada's hearing lasted far longer than normal. When the defense objected to Patterson taking the stand, Assistant U.S. Attorney Timothy Reardon argued that his testimony would "explode the myth that there was some sort of government conspiracy to lie in wait for Mr. Posada." Posada was held in an immigration detention center in El Paso for about two years but released in 2007 and has been living in Miami. Cuba and Venezuela would like to try him for the 1976 airliner bombing and the 1997 hotel attacks, but a U.S. immigration judge has previously ruled Posada can't be sent to either country for fear he could be tortured.